MISSION, KS--(Marketwired - Dec 17, 2015) - (Family Features) Whether it's relaxing at home, dining out at a restaurant or celebrating with friends and family, Americans are enjoying wine at a wider variety of occasions than ever before. 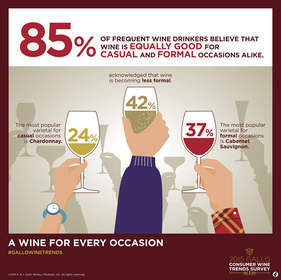 In fact, 85 percent of frequent wine drinkers now believe that wine is equally appropriate for casual and formal settings alike. Mirroring the changes in wine drinkers' shopping habits, the wine industry is thinking "inside the box" these days. Boxed wine has evolved considerably in the minds of consumers, thanks in large part to its convenience. The extended freshness of boxed wine allows wine drinkers to enjoy it at their own pace and the box's portability allows for easy transport to all types of occasions. In fact, 1 in 4 surveyed agree that boxed wine is best for large social gatherings and is becoming higher quality. Wine in a can is a relatively new concept that more than one-fourth of frequent wine drinkers expressed interest in trying -- particularly for outdoor excursions. Among fans of alternative packaging, outdoor events remained the primary occasion for the use of these products, which also include mini bottles and tetra packs. "The increase in popularity of these new packaging options is undeniably making wine more portable, practical and possible to enjoy anywhere," Gallo said. "A single-serve package, in particular, offers a convenient option for those who reluctantly grab a beer simply because it is easier."